The 21st December 2013 was the Winter Solstice - the longest night of the year. An opportunity for adventure. On the 20th, we had driven through the night from London, heading to the French and Italian Alps for an ice climbing adventure. We were in an RAF minibus with 8 guys from the RAF and the Royal Marines. Charley had made friends with Tim whilst climbing in Chamonix in the summer, but everyone else was a new face to get to know. We arrived at dawn on the 21st of December in Cogne, an ice climbing mecca nestled in the heart of the Italian Alps. We parked up the van and headed towards an ice fall route called 'Cascade de Lillaz'. Armed with ice axes, crampons, ropes, ice screws and gloves (that weren't thick enough) we were eager to get to the route and check out the conditions. It's only by getting up close and touching, listening and looking at the ice that we could see if it was safe to climb. The winter conditions in the Alps have been variable recently and it's important to properly assess conditions before climbing. Our party separated into our various climbing partners and all found different pitches to climb on the route. Charley and I found a nice cone to climb that sounded a lot more solid than the route Tim and Tom climbed next to us. Charley led both pitches like a pro, I seconded. Upon reaching the top of the first pitch the damn hot aches came. The pain seemed to last forever. They're so mean! I tried to distract myself with my surroundings. The ice was beautiful with clear blue skies above us and the sun warming the opposite side of the valley. As we prepared for the second pitch, I looked around at my new friends and smiled. Everyone was in their element. There was a lot of talk about "getting psyched", comparing ice tools and of course, the conditions on the ice. It was certainly very thin at times! At the top, we abseiled off and headed down the valley to warm up in the sun. Next up, lunch in the car park. Great views and much laughter. By now it was 3pm, time to start thinking about where we were going to camp for the night. We headed to a village called Valnontey in Val Di Cogne. After much debate about how many layers to pack for our night in the snow, we headed out into the wilderness and found a spot under a tree. We laid out our roll mats and cracked open the beers. By this point, I felt as though these guys had become good friends. Not only had we spent over 15 hours in a van together, with a lot of military-esque banter. We had shared a unique experience on the ice and were now sleeping under the stars together. It's something we all love, right? Meeting people who share our thirst for adventure. People who love being outdoors and challenging themselves. We share experiences that forge great friendships, often leading to more adventures. It's with our friends, old or new, that we become partners. Climbing mountains by day, drinking whiskeys by night. We share tales of past adventures, we inspire and encourage each other to dream big and plan for the future. It was a beautiful night and a wonderful adventure. We fell asleep at 9:30pm and woke up at 8:30am. It wasn't that we were especially tired, perhaps it was the tranquility of our surrounding seeping into us, wrapping us up and keeping us asleep. It was also considerably colder outside our sleeping bags than it was inside, making delaying getting up an easy choice! The following day it was both Charley and Dan's Birthdays. We made some questionable porridge, packed up camp and headed back out for another day on the ice. Just because it's winter, don't let the excuses set in. There's no such thing as bad weather for adventures, we just need the right kit. 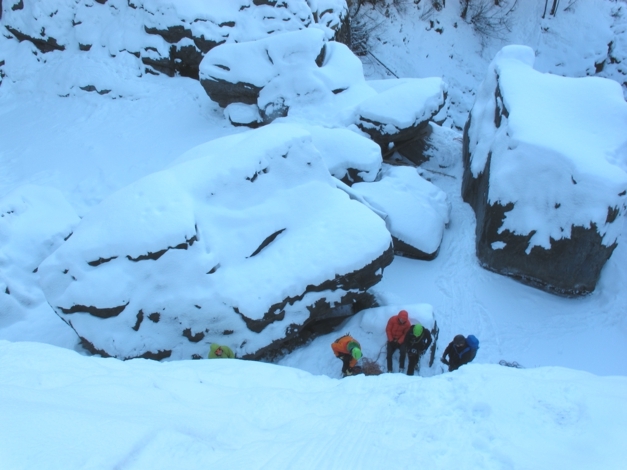 If you want to give ice climbing a try, you don't need any previous climbing experience. However, you need to do it in a safe environment so either hire a guide, or go with someone very experienced. Our night sleeping in the snow inspired me, now I'm hungry for more winter adventures and bivvying under the stars.